I like to keep in touch with Stephen Harper by email, you know, to remind him us peasants care about issues like the environment, the seal hunt and human rights. So far the Prime Minister hasn't emailed me back but I do receive the occasional form letter from whatever Minister his office has forwarded my complaint to. 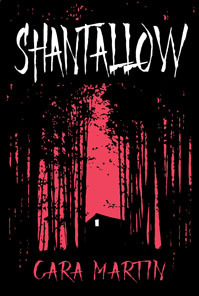 And of course there was Stephen's Easter card, which was interesting but a little unsettling. So anyway, it's not like the PM and I never communicate. 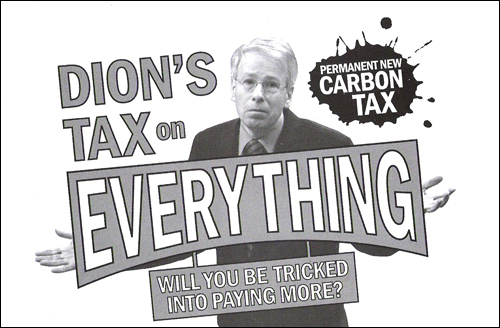 Why just yesterday I received a thoughtful message from him informing me that Liberal leader Stéphane Dion is a goofy French guy who wants to steal all my money (and yours) through his idiotic carbon tax plan. To be honest, I found this a bit confusing at first. I'd been under the impression that Canada should take decisive action on cutting its carbon emissions. Of course, that was before I really had time to let the leaflet from the PM's office sink in. I mean, get a load of this wimpy Dion dude. The picture says it all. There's no need to even open the leaflet up and read about how "foolish" and "misleading" the carbon tax is. Obviously Dion doesn't understand what's good for Canada! I don't even think English is his first language—otherwise his name would be Stephen instead of Stéphane right? Clearly Dion is a trickster and a loser! Or so I thought until the below leaflet showed up in my mailbox this afternoon. 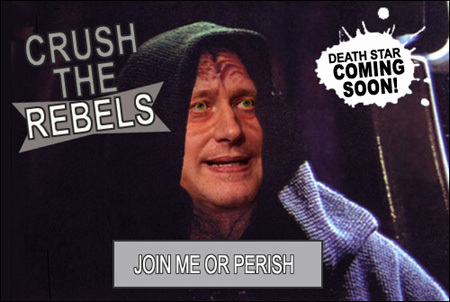 Yep, Canadian Prime Minister Stephen Harper's transformation to Sith Lord is almost complete. 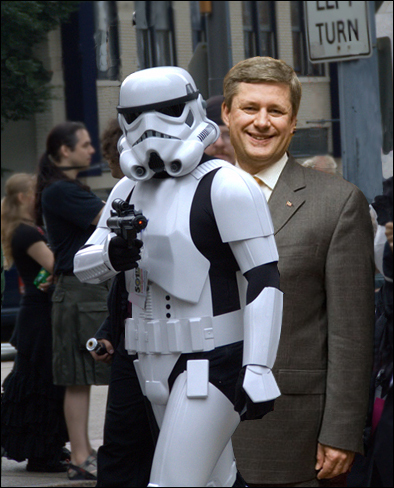 Harper has zilch interest in imposing a carbon tax on his subjects but what do you want to bet there's talk of a Death Star tax on the horizon? Those gargantuan death stations don't pay for themselves, you know. I can't believe he had me fooled—even for a day! Really, we should've guessed this was coming, what with the company he's been keeping from day one. Sigh. Where are Han Solo, Princess Leia and Luke Skywalker when you need them? Yoda? Chewy? R2?